Personal Details – Kent Huffman: Marketing. Branding. Strategy. Tactics. Results. Although he didn’t serve in the military, Kent Huffman has a lot of respect, admiration, and appreciation for our veterans. Over the last few years, he’s worked as a fundraiser and volunteer for AUSA’s annual Wounded Warrior Golf Classic, which benefits Operation Once in a Lifetime. Kent’s former employer, BearCom Wireless—along with Motorola, BB&T, Cabela’s, PGA Tour Superstore, ClubCorp, 18 other sponsors, and 200-plus golfers—helped to raise more than $100,000 in 2012 and 2013 to support wounded veterans and their families in North Texas. Kent also is an enthusiastic supporter of Animal Preservation of East Texas (APET). This SPCA facility in Mineola seeks to provide refuge and adoption options for a multitude of homeless dogs and cats in East Texas. APET also strives to reduce the number of unwanted pets and diligently work toward the goal of reducing animal cruelty—including neglect and abandonment—through a comprehensive, low-cost spay/neuter program. In the past, Kent has served as a volunteer for Big Brothers Big Sisters of North Texas and a route driver for Meals on Wheels of Collin County. These two fine organizations work tirelessly to help improve the lives of children and the elderly. Kent and his wife, Judy, love spending time with their family and friends in beautiful East Texas. 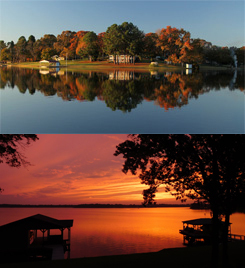 On most any weekend throughout the year, you’ll find them boating, jet skiing, fishing, and enjoying the incredible sunsets at their cabin on Lake Holbrook near Mineola. Kent and Judy also enjoy exploring the Caribbean, especially snorkeling, SCUBA diving, and mixing with the locals. One of their “bucket list” goals is to eventually visit every island in the archipelago. So far, they’ve made it to 19, including multiple trips to their favorite destination in the U.S. Virgin Islands: St. John.